Disclaimer: Do As I Have Learned NOT As I Have Done! Teva is my first dog and I absolutely love her more than I could have ever imagined. It’s been quite the responsibility and I still have a lot to learn as a first time dog owner. That being said, I am certainly open to any comments and suggestions you might have! The biggest thing I have learned with Teva is to understand her personality and try and predict her next move before she does it. While I have gotten pretty good at this, she never fails to surprise me. Teva is sweet as ever, but she has a mind of her own, she is too smart for her own good and must explore and play with everything and everyone. As a result, I have to choose fishing locations for her that are less traveled based on the following questions we should all ask before taking our dogs fishing. You’ll never get me up here Dad! 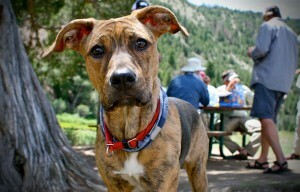 Does Your Dog “Come” on Command…No Matter What? Until recently, Teva knew she was way to fast for me to catch her and that when she gets outside I was on her time until she was ready to “COME HERE!” A shock collar has helped a lot, but we are still far from perfect. 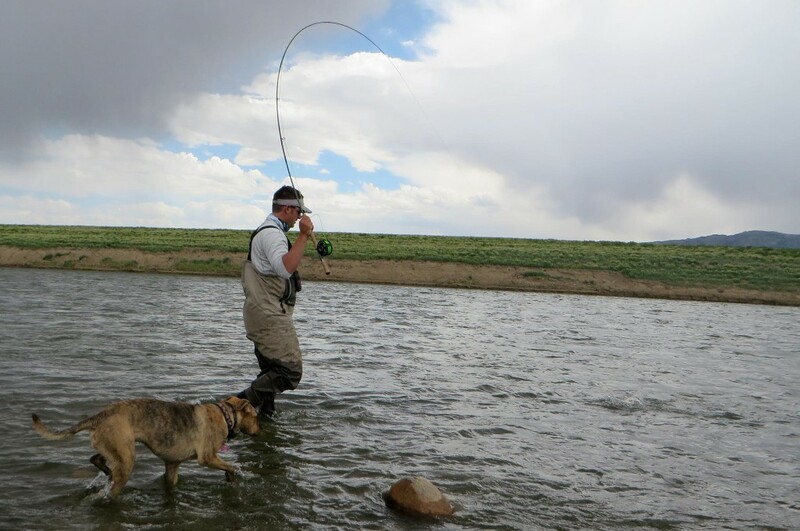 Let’s face it, nobody likes your dog the way you do, and if your dog has to run to everybody on the river, it’s probably best to fish spots where it’s highly unlikely you’ll see another human. She Means Well, but Do Other People Know That? Teva’s favorite thing in the world is to be chased. If it’s another dog, she will antagonize them until they decide to play with her. If it’s another person on the river, she plays this shoe lace game where she tries to untie your shoe laces in hopes you’ll play with her, yell at her, throw a stick or anything that get you to pay attention to her. If you have any training suggestionsfor this other than lighting her up with the shock collar, PLEASE let me know! The bottom line, if your dog has to play with everyone, best keep her out of that situation for other the sake of other anglers. 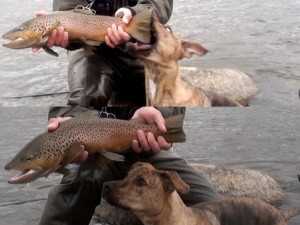 Does Your Dog Understand Catch and Release? Teva has heard a lot of screaming reels and she knows what it means when a rod gets bent and nets come out! She wants that wet, squirmy thing that just came out of the water SO BAD! The shock collar, putting her in the car and plenty of trailer hooks to the tongue have have had zero effect in breaking her desire to snap at your catch & share in the excitement. The funny thing is, I have given her a sucker or two and when she can actually play with a fish, she is relatively uninterested…go figure. Suggestions welcomed! Is Your Dog a Swimmer? The one positive with Teva is she is more interested in wading than swimming. She certainly knows how but she would rather run up and down the banks than swim across the river. However, we’ve all fished around that dog who won’t stay out of the water, so be mindful of that! 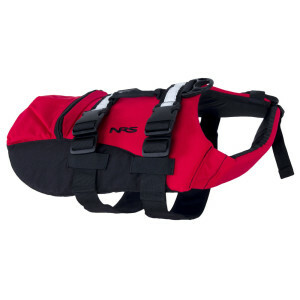 BUY NRS DOG LIFE JACKET ONLINE! Doggy Life Jackets: Teva’s lack of desire to swim & me avoiding a river situation where a boat might flip has kept me from investing in a doggy life jacket for her. Even so, accidents happen and I am done taking chances & will be getting her one. 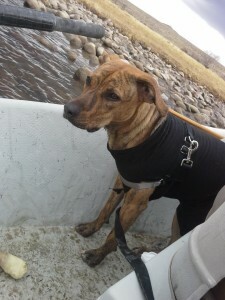 If you are going to take your dog in rough water respect the river & make sure that every passenger in the boat (including your dog) has a life jacket on. A few year back, friends of mine flipped a raft on the Colorado River during runoff and there beloved dog on board didn’t make it. Respect the river, and if you are going to be in rough water, make sure everybody has life jackets. Buy Dog Life Jackets Online Free Shipping! FISHPOND BOW-WOW DOG BOWL BUY ONLINE! Heat: When it gets hot outside, make sure your dog has some shade and gets water. I try and remember to bring a dog bowl to give her water during the day as opposed to just drinking river water that can give dogs all sorts of nasty stomach bugs. Keep an eye on your dog and not just your fly. If your in a boat, pull over and let your dog cool off in the water once in a while. 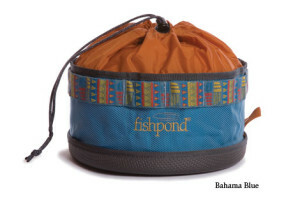 Fishpond makes a foldable dog bowl that is easy to cary when you are on the river. Cold: The freezing cold is one I have had to deal with more with Teva because those are the times I know we can go fishing and not have a ton of people and distractions for her around. I would think by now she would have learned that when she gets wet, she is gonna get cold real fast but she insists on wading. Pretty much once this happens and she stops running and starts shaking, I get her to the car, dry her off, put a blanket around her, and keep the car and heater running while I fish. Ever 20 minutes or so I’ll go and check on her to make sure she is ok. There are also times when I open the car door in WY, the wind is howling, snow is blowing and she jumps right back in. This is probably the time to just let her hang out in the car. Again, I keep the car running. If you arrive at the river and it’s colder than expected and you don’t have doggy clothes, be creative. I’ve taken fleece sweat pants and cut the legs off. Poke 4 holes in it and Teva is good to go! Hooks: Rabbit fur, elk hair…basically things dogs like. 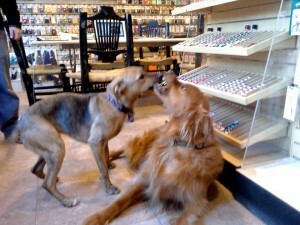 When Teva was a puppy, she grabbed an elk hair caddis off a rod and it got stuck in her throat. What was I thinking! Off to the vet, where the X-ray also found a #14 BH pheasant tail in her stomach. They were pretty sure she would pass the pheasant tail (she did) but the Elk hair caddis had to be removed. $1,500 bucks later I was handed a #16 Pearl & Elk Caddis. So if your dog hangs out in your car, make sure your rods don’t have flies on them or you keep the fly collection on your vehicle visor down to a minimum. I learned a scary lesson this past week that I think we should all consider. I’ve seen enough rattlesnakes on the North Platte River that it was always a concern in the back of my mind. That being said, I can’t say I have ever heard of anybody’s dog getting bit by one on the river. Still, I try and fish the less snaky looking areas, but the bottom line is they can be anywhere. Somewhere between a mad dash to the car as it started to rain and getting into the car, Teva managed to find one. As we drove back from the Miracle Mile to Alcova, I saw the side of her face beginning to swell and fluid building in the skin beneath her neck. 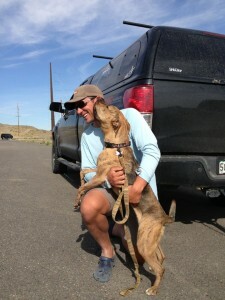 I had no idea what it was but knew I had to rush her to an emergency vet in Casper. Teva happy to come after two nights at the vet where she made a full recovery! The great Vets at Casper Animal Medical Center quickly diagnosed her wound as a rattlesnake bite. 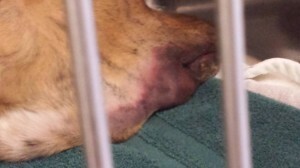 She stayed for two nights, was given several different shots & IV fluids, antibiotics & pain killers. She made a full recovery, and is back to her usual self. For me, it was a scary and serious wake up call. The one thing I did right was take her to the vet immediately even though I didn’t see her get bit. Had I waited, it could have been a bad outcome. I still feel terrible for putting her in a situation where I knew there were rattlers and that if she came across one, she would have to check it out. 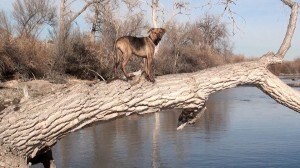 I also know that she loves the river & she is a happier and better dog when she gets outside. Before we head out again during snake season, I will be taking the following two preventative measures & would strongly encourage anyone who takes there dog fishing, hunting or hiking in snaky places to do the same. Rattlesnake Vaccines: Dogs are about 300 time more likely to be bit by a rattlesnake than to get rabies. With that stat, I think it’s something we should all consider. The vaccine stimulates a dog to create their own antibodies to rattlesnake venom that will protect them from bites that happen in the future. These vaccines are safe, affordable & effective. Ask your vet about the vaccine. Here is a good article with more information about the Rattlesnake Vaccine. Rattlesnake Training: There are also several training courses where dogs are put in the same place as a non venomous (defanged) rattlesnake. In this course dogs learn that the smell and sound of a rattlesnake is danger. I’ve seen it done at the International Sportsmen’s Show in January and it seams to work pretty well. Here is some info on rattlesnake avoidance training courses for dogs. Final Note: Medicine Bottles are Not Dog Proof! As if this past week wasn’t rough enough on Teva and Dad’s wallet, she managed to grab a bottle of the anti-inflamatory/pain killing medicine she was sent home with off the counter. These are chewable and I came home to an empty bottle of her medicine & another trip to the emergency Vet. 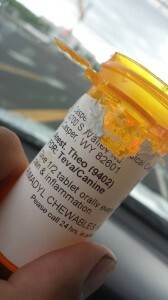 So, if your dog is like Teva, keep all medicines in a place your dog can’t get to them and save yourself $1,000 bucks!